Small spaces are a challenge for any family, especially with children and pets. Luckily, we have created a list of the best cheap DIY storage ideas for small spaces. Clutter builds up in your mudroom, bedrooms, and on top of your coffee tables. Before you know it, there are more things on the floor than on the furniture! If you feel like you have too much stuff and not enough storage, the tips below will help you maximize the space you already have without spending a fortune on fancy storage units. These top nine ideas for cheap DIY storage ideas for small spaces have been compiled here based on popularity and practicality, starting with our favorites. These are a fun and creative way to keep items close by without the need for bulky furniture. Floating wall shelves can be used as nightstands, bathroom storage, or even hallway storage. These shelves are easy to assemble and install without spending a ton of money. 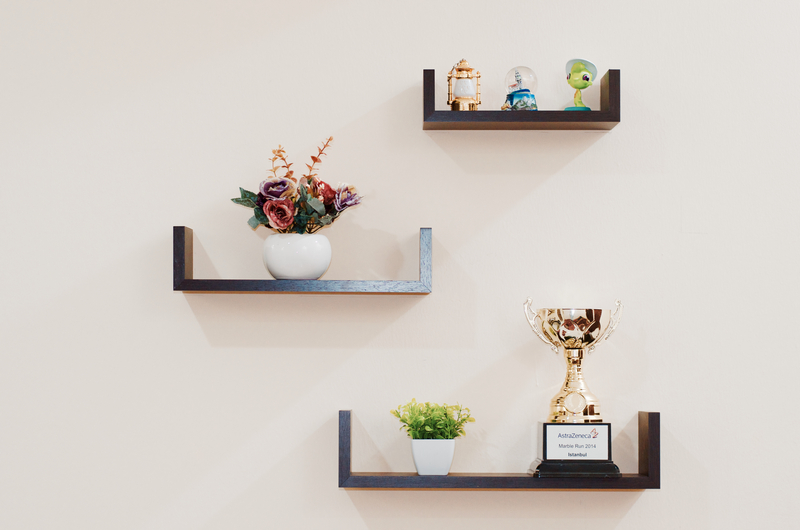 Floating shelves can be purchased from your favorite housewares store or even online from places like Amazon. You can match the shelves to your décor and style. Floating shelves come in all colors and sizes, but we love these white cube shelves from Modern Home. Be mindful of weight limits as you start putting all of your goodies on your new pieces. When looking for cheap DIY storage ideas for small spaces, under the bed storage is one of the most popular suggestions. Before starting an under the bed storage system, make sure you have decided what items you want to store there. Extra bedding, toys, and even books are great places to start. You can purchase special storage units online like plastic rolling bins, or you can make your own. The entryway to your home is a great place to literally stop the mess at the door. Bulky items like coats, jackets, and boots can all be sorted into large bins strategically placed in your foyer. You can make an assortment of hanging furniture to catch keys, scarves, and hats out of everyday items you already have. Cleaning up the first space you walk into when you get home will help make sure these items don’t end up scattered all over your house. Toy hammocks are one of the most fun, cheap DIY storage ideas for small spaces. They can be purchased for less than $10 on most online e-commerce platforms. You can also make your own toy storage from string following this DIY tutorial. You will need to talk safety with your toddler or young child when using a storage system like this, but most kids just enjoy throwing their toys back into the hammock when they are done playing! No more fussing over clean-up time. Scarves and belts are always taking up more space than they need to. Hanging these items vertically just makes more sense once you find the right hanger. You can easily make your own scarf and belt hanger using a thick plastic hanger, plastic shower curtain rings, and some industrial tape. But overall, hanging these simple items is one of the easiest cheap DIY storage ideas for small spaces. If you need space in your home and are considering renovation, there are must better cheap DIY storage ideas for small spaces that don’t involve an expensive contractor. The 3-4 inches between your fridge and the wall could be used for narrow pantry storage. A good idea is to turn closets under the stairs into office spaces. Often there are panels between studs in your home that you can easily remove to create recessed storage spaces in your kitchen, living room or bedroom. Be sure to use a stud-finder or floor plan before you remove any wall space in your home. Storage ottomans are a great place for extra shoes, magazines, children’s toys, or extra blankets. You can buy them at almost any home store, but you can also make your own to suit your needs using any of the ideas found here. You can also make your own storage cabinets for baskets and boxes following any of these plans. Another of the simple, cheap DIY storage ideas for small spaces is to reorganize your home office. You can easily mount dry erase, cork boards, and file folders with thumb tacks to hold documents, bills, and reminders. One can simply glue together mason jars to create stylish utensil storage. Moreover, you could nail an old window shutter to the wall and used as a mail organizer. There are plenty of great ideas you can find online. The sky is the limit! Keeping baskets full of items not used very often on top of those hard to reach cabinets will open up more space for you down below. The only drawback to these cheap DIY storage ideas for small spaces is that when you do need something inside of one of the baskets, you may find the climb inconvenient. Don’t have tons of baskets lying around? Take thick cardboard boxes, cut the walls down to fit, and paint them with any design you like before storing items inside. In conclusion, these DIY and cheap tricks will help you maximize the spaces you already have in your home without wasting money on fancy items you can make yourself. Do you have your cheap DIY storage ideas for small spaces to share? We would love to read them. Leave your ideas in the comment section below, and let us know if you tried any of ours!